Alpinestars has jacket with a built in airbag system called Tech-Air, which has now been licensed by BMW as well. Der StreetAir Anzug von BMW Motorrad. Mehr Schutz in Millisekunden. This tech has already been use in MotoGP for a few years and will now be available for regular folks like us. I really like that this does not require any installation on the bike itself. I think this is a huge leap in rider safety. It will probably be a little expensive in the beginning - would like to see these go on sale in the US soon. Very cool, but need to be bigger. Sort of like the ones in the movie Tomorrowland. You end up encased in a big giant ball. Maybe some day. On a serious note, anything that can help keep us safe I'm all for. I'm one of those people who would never even think of riding my motorcycle without a full face helmet, leather jacket, gloves and boots. Last edited by JAYinNY; 09-30-2016 at 08:43 AM. shelf life is my main concern. I tend to get gear and keep it for a long time and have some gear I only use every couple of years. That one you uploaded made me envision something similar to 'The Michelin Man' only in orange and gives new meaning to the phrase 'I'm on a roll now'. Last edited by bilbikek411; 10-04-2016 at 08:13 AM. I agree. I think it will take time for them to work out the kinks and make this a solid reliable offering. Currently they claim the battery lasts a day, and takes about 6 hours to fully charge. You also need to "service" your jacket every two years - they probably update the software and do an inspection of all the components. There are some at our local Ducati dealership. They sure look nice, but not $2500 + nice. Shenandoah Valley near Stuarts Draft Va.
Amazon has several air bag jackets for about $500. My life jacket that inflates when I fall out of the boat was less than $100.00. A jacket for a bike crash would have to be a lot stronger but $2500?? Why not a lanyard to inflate the jacket when you come off the bike. Look at all the fun we could have when people get off the bike and forget to unhook the lanyard. ancientdad and oupa like this. These things have had a presence in racing for several years now. Even becoming, well... not "common" but less than rare in flat track racing. To that end, I just listened to an interview with rider Shayna Texter last week where she mentioned her air suit deploying accidentally costing her a race. Granted, an accidental discharge of your air suit is considerably preferable to hitting just about anything without one, but we have to pay for our own to. Since they obviously DO go off unexpectedly occasionally, I'm now curious as to what's involved in re-use. CAN it even be reused? I dunno. Regarding cost. Unless you're comfortable with a level of inflation that would look like the Michelin Man, these things need to fit fairly close. That means tailored to YOU. 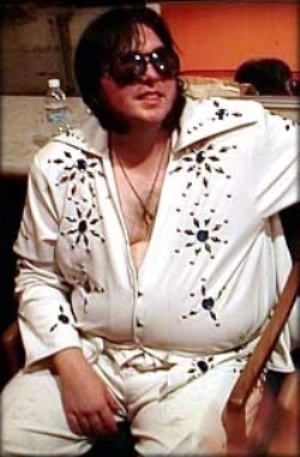 That means a lot of us would be looking something like Elvis in his last jumpsuit. There are trade offs in everything I guess. I have a full set of (non-inflating!) racing leathers. They have a purpose. They are hot and confining. There is a reason why you see guys unzip their leathers as soon as they get back in the pits! I would hate to wear them for every motorcycle ride. We are seeing technological advances everyday that a year ago would have been sci-fi though. These things will evolve to. While we wait I think I'll practice my singing.